This running condition Craftsman Snow Blower is 8 HP and 25 inches (63.6 cm). Good tires and good condition. This machine has been regularly serviced by a Sears Technician/Mechanic. 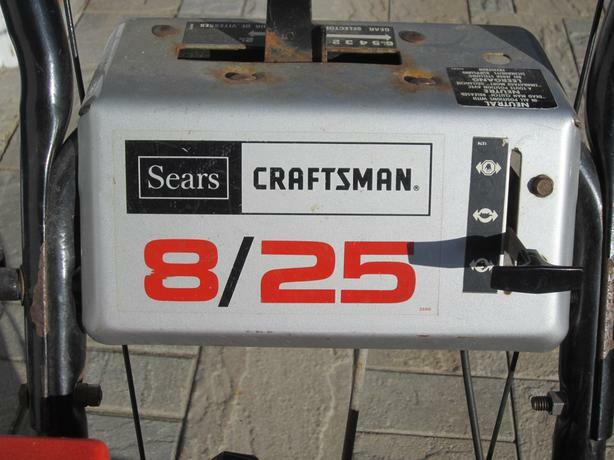 At the closure of the Sears Service Centre this same Technician continued to service the machine, coming regularly to my home to provide the service. This service consisted of carburetor adjustment or cleaning and overall when necessary (which was seldom), oil, lubrication, bolts/nuts/ and screw check. Practically no use the last 5/6 years. Spouse presented me with a snow removal contract. Finally realized the extra room I would have in my single car garage if it was gone. Cannot deliver.